OCS has developed a number of comprehensive proven Inspection and Audit programs that are associated with the inspection services that OCS Group provides. By doing so the client can be assured that all essential equipment and methodologies are fit for purpose, in good operational condition and verified for compliance with international standards and requirements (Including API, Classification, National Standards). 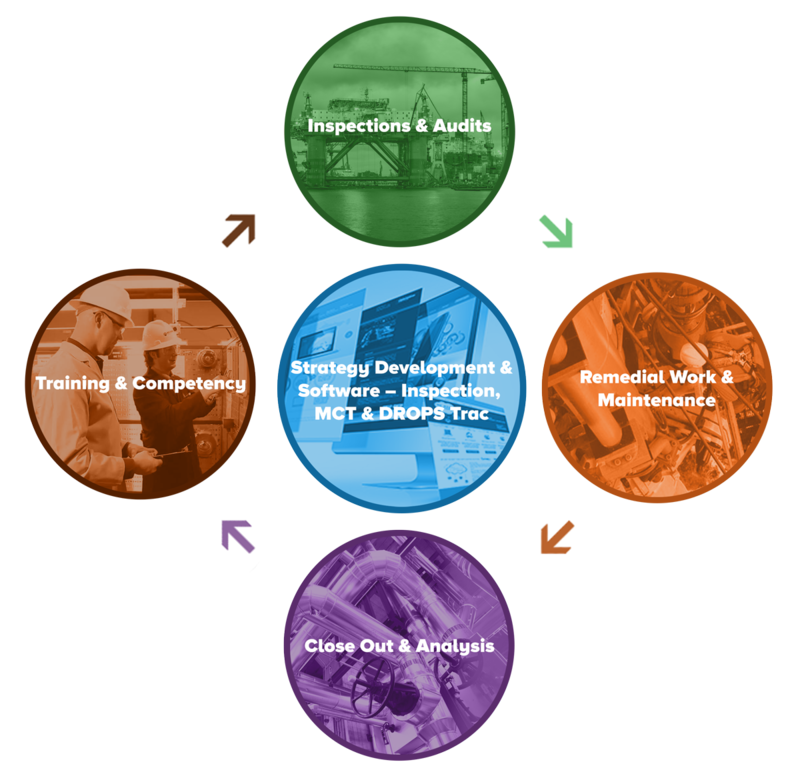 In addition, the data gathered from the lifecycle of services that OCS offers can easily be integrated into a client’s Audit, Maintenance or ongoing Inspection strategy. Strategy Development and Software – Inspection, MCT and DROPS Trac. Whatever your Inspection Type is, a company should have a Strategy to achieve their objectives. A proven strategy achieves increased efficiencies including cost reductions and improved inspection and maintenance results. By developing or adopting a global strategy that has the associated resources to equally review all assets on an equal basis as the same standards and processes are adopted. OCS Group has developed in house a software known as “Inspection Trac” (PDA Inspection system) that can improve efficiency by the removing the need to print inspection sheets / ITR’s and then having to fill them in manually and then upload them into a maintenance system. In addition to the improved efficiency of using a PDA system for the inspection, a company may also have a Strategy to achieve their objectives, this software can also help and assist by managing the maintenance strategy you have for example, Hazardous Area Equipment Maintenance. Significant financial savings are available through implementing an efficient inspection system or a management strategy if applicable and utilizing a PDA inspection software solution. Our inspection solutions are capable of analyzing the strategies performance (KPI’s). Specifically for Hazardous Area Inspections OCS Group has developed the world’s leading Hazardous Area and inspection management software currently being utilized by operators and drilling contractors globally in both the upstream and downstream markets. This software is explained in more detail in either the Hazardous Area Management and Inspection Pages as well as the Software Page. Inspections and Audits: OCS Group is the industry leader in providing 3rd Party Rig Inspections and Hazardous area inspections, with clients consistently requesting repeat services. Our technician and inspectors knowledge is unparalleled and we ensure that the inspection is completed to the highest standards. OCS Group completes the inspections as required based on the company strategy and appropriate Jurisdiction. Audits are typically conducted specifically for the client depending on their requirement and based on their company policies, regulations, standards, best practices and manufacturers recommendations. Remedial Work and Maintenance: OCS completes any Remedial Corrective actions during or at the conclusion of the completed inspection. This allows your asset maintenance personnel to continue with their ongoing tasks. OCS has extensive experience of providing ongoing maintenance, equipment installation, equipment overhauls etc. Close out and Analysis: After any inspection a review is critical to have a better idea of results and that can give a realistic overview of the performance from the data collected. This informs clients of specific actions that may improve performance, safety so that a continuous improvement process can be developed. OCS results from inspections measure certain KPI information that better helps analyse the inspection results to determine if the KPI’s require changing or the inspection strategy needs tweaking. Training and Competency: OCS supplies competency, technical and safety training for Hazardous Area Equipment that is compliant to Regulatory Authorities Requirements for all Jurisdictions worldwide. At the end of the training period the student will receive a Certificate of Competency if successful from the certifying Authority, (JTL – CompEx or IEC for IECEx – CoP). Training provided can cover IEC, NEC/API 500 / 505, or IADC requirements. OCS can also provide on-site compliance training to ensure the company strategy is completed as required. A proven strategy achieves increased efficiencies including cost reductions and improved inspection and maintenance results. By developing or adopting a global strategy that has the associated resources to equally review all assets on an equal basis as the same standards and processes are adopted. There are various strategies available that if adopted would result in drastically reduced costs for the company. OCS Group is the industry leader in developing strategies for all inspection requirements including hazardous area strategies. OCS’s Risk Based Assessment approach also is developed into other inspection types, Rig Inspections, High Voltage Systems, and Drops etc. We look at the risks that are more critical for both Safety and Operations. OCS calls this approach “Safety Critical and Operational Critical” approach and reviews only the items that are important to an operation in these areas.